Total Comfort Mechanical, a Massachusetts heating and air conditioning contractor, has earned the service industry’s coveted Angie’s List Super Service Award, reflecting an exemplary year of service provided to members of the consumer review service in 2013. To set up an appointment with Burlington MA’s favorite heating and air conditioning service, call (718) 697-9016. For more information on their services and specials, visit their website: http://totalcomfortmech.com. So what IS ductless air conditioning? Ductless (also called mini-split) AC systems are an efficient and affordable alternative to traditional central heating and air conditioning. Going ductless is a flexible, high-efficiency option for those looking for simple, zoned comfort solutions systems without the need for extensive lines of duct work to circulate air. Multi-zone units also can be used to control temperature in different rooms. 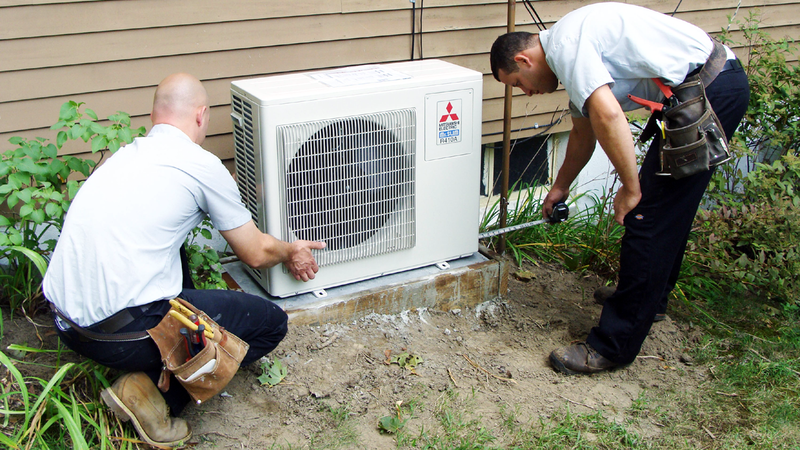 Ductless systems consist of one or more outdoor compressor units and indoor air-handling units, called “heads”, linked by a dedicated refrigerant line. 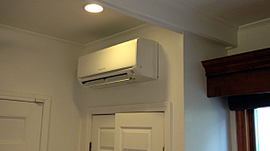 Ductless Mini-Splits are an excellent choice for cooling bedrooms, offices, bonus rooms, add-ons or any space in which installing duct work is not feasible. The system is made up of the indoor unit which can be mounted on the wall or ceiling. The small indoor unit connects to the outdoor unit. Multi-zone outdoor units connect multiple indoor units, providing individualized comfort control to different areas within the home. Homeowners have given rave reviews about how quiet Ductless Mini-Splits are when operating, which is done by convenient remote control, programmable touch-screen thermostat controls or WI-FI. Ductless air conditioning systems consume less energy than traditional central air conditioning, which can dramatically reduce your energy usage. For zoned systems, you can control individual room temperature and only use energy where and when you need it! Installation is fast, easy and affordable. AND – your local utility may have incentives available to upgrade to a ductless system – many localities do, and you could save as much as 30%. Check for incentives in your area with Ductless Heating & Cooling Systems’ website – they provide a convenient Utility Incentive lookup tool at:http://goingductless.com/consumer/how-to-go-ductless/utility-incentives. In addition, purchases of qualifying systems may be eligible for the Federal Energy Tax Credit (see related article – Congress Extends Energy Tax Credits on Air Conditioning & Heating). A trained and licensed HVAC contractor can help you determine if a ductless air conditioning system is a viable option for your home and recommend which product options are right for you. For more information, contact Total Comfort Mechanical Heating and Air Conditioning Service website at http://totalcomfortmech.com.